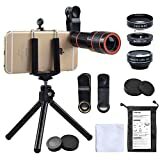 18X TELEPHOTO LENS: Cell phone telephoto lens with high quality & multi-layer coating glass to get a clear photo for a far distance object. Non-slip rubber focus wheel makes you easy to focus.. 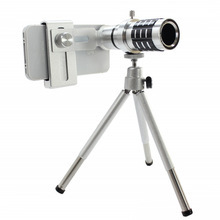 CLIP ON & TIGHTEN SCREW: Phone lens kit with old version clip may slip due to the weakness. However, Strong clip with extra tighten mechanism can avoid slipping. tight & precise connection make it more stable to take photos..
HOW'S THE CELL PHONE COMPATIBILITY: Having test on most of mobile phones on the market. They can suits on iphone & samsung and Pixel. 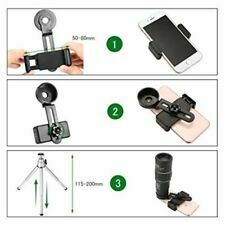 For more phone-compatibility questions please CONTACT us..
A MULTI-USE PHONE LENS TRIPOD:The tripod (Thread) is compatible with gopro & mirrorless camera & monocular for better video recording and wildlife watching. Easy to transform form handheld to stand..
100% CUSTOMER SATISFACTION: we will consistently to obey the customer-centric guidelines & offer high quality customer service. We love our products and we are happy to solve any question you come across with the lens kit..
♛Features: 100% brand new and high quality Monocular Telescope, Outlife 50X60 BAK4 Prism & FMC, HD Night Vision with Phone Clip and Tripod for Bird Watching, Car Racing,Horse Racing, Hiking, Boating and Sightseeing NEW TECHNOLOGY:Thins is a material of high refractive index, which can effectively avoid dark corner and make images become clearer and brighter. FMC multi-layer broadband green film is coated with high transmission optical film for a better image, contrast and quality..
♛52 MM BIG OBJECT LENS: This object lens with objective diameter 52mm enables you to see the object more clearly and brightly. It can also broaden your view, perfect for bird watching, concert and sightseeing. 22 MM OVERSIZED EYEPIECE: The size of the eyepiece is larger than other eyepieces at the same level by offering you an unobstructed sight, a brighter view and long-term use without fatigue..
♛A NEW FUNCTION-COMPASS INSTALLATION: A compass is mounted on the side of the telescope so that you won't get lost during the trip. It is no doubt an outdoor survival guide for a safer journey. ADJUSTABLE PHONE CLIP: It comes with an adjustable phone clip that helps you put your phone on it to get HD images easily..
♛DESCRIPTION This monocular features BAK4 prisms and multi-layer broadband green film that make your view wider, clearer and brighter by giving a superior light transmission and brightness.The edge has the design of eliminating light stripe, which can reduce eye fatigue. HIGH POWER MAGNIFICATION. ♛This 52 mm object lens telescope is coated with HD optical green film, which provides you a clearer and brighter image for outdoor adventures. Perfect for hunting, bird watching, camping, ball games, horse racing, sightseeing and concert. 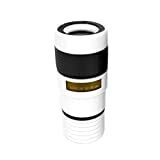 SMALL BUCKLE WITH RUBBER ARMOR WITH STRIPS Small buckle design makes the monocular telescope easy to carry. The rubber armor with strips makes it comfortable to use and keeps it from slipping out of your hand.. Description:Item type: TelescopeApplicable: Zoo, concert or watch the gameColor: Black, grayObjective diameter: 18MMProduct Size: 38 * 73mmMaterial: Plastic, rubber, glassExit pupil distance: 11mmMagnification: 8 timesExit pupil diameter: 2.5 (mm)Features:Easy to install and remove, convenient to use.Package includes:1 * telescope, 1 * Universal phone clipNote:The colors deviation might differ due to different monitor settings.We provide you with the best product and service, if you have any problem, please let us know, and we will solve the problem ASAP. Thank you so much. 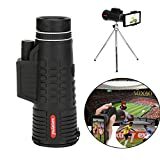 Made of high quality material, eco-friendly, strong, durable.It has a good zoom and focus, the view can be very clear by turning the focus.Perfect for zoo, concert or watch the game, allows you capture the scenery far away clearly.Simply clip the phone lens on your phone camera and it gives long vison, excellent color reproduction close-up pictures. And when I say little; I mean it. The HD360 Zoom is less than 3 long and weighs less than 2-ounces, so it s extremely easy to carry around with you. And the fully universal clip technology allows you to use the lens on any smartphone, so you won t have to buy a new one!. The HD360 Zoom was developed for the recreational photographer who wants to take professional quality photos, but can t afford a professional camera. The price is affordable for almost any budget and it s easy enough for anyone to use. 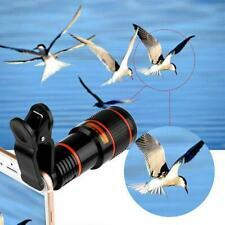 If you ve ever had a dream about taking high-quality photos from your smartphone, then your time has arrived!. Are you a social media aficionado who likes to post pictures of everything you do? How about someone who likes to take pictures of outdoor objects, but doesn t want to spend money on a big camera with a quality zoom? 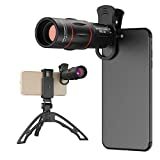 If you ve ever been jealous at the quality of some of the photos that you see, you may be surprised to learn that they didn t spend hundreds or thousands of dollars on a standard DSLR camera..
4 Great Lenses Accessories in One Kit: Awesome mobile photography for iPhone Samsung HTC LG Google Huawei Xiaomi. 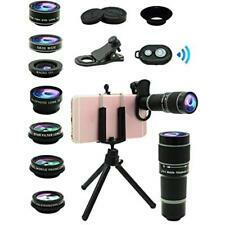 Includes 4 lenses: 12x zoom telephoto lens with manual focus ring, fisheye lens, macro lens and wide angle lens. Combine with your favorite apps to share photos instantly!. Enhanced Photography + Video: 12x zoom lens delivers superior quality pictures from a distance without you having to get too close to your subject. Fisheye can give your images a round, fish bowl effect. Macro can capture amazing close-ups in crisp detail. Wide Angle allows you to capture larger scenes. For example, long cityscapes and large group shots..
Removable Telephoto Monocular Lens: Never miss any remarkable and unforgettable scene. This removable clip-on camera lens can also be used as a standalone telescopic lens to help you view distant objects, sceneries, games and concerts more clearly.. Wide Angle and Macro Lenses in a 2-in 1 Set: These two small lenses are screwed together for easy storage. To use the wide angle, simply attach both lenses to the clip provided. To use the macro lens, simply unscrew the wide angle lens.. Wide Range of Compatible Devices: Portable, removable and solid clip-on design that attaches to almost all smartphones including iPhone 7, iPhone 6S, 6S Plus, iPhone 6, 6 Plus, iPhone 5S, SE, Samsung Galaxy S6, S6 Edge, S7, S7 Edge, HTC, Sony, LG G6, G5 and many others..